Once upon a time, Republicans presented themselves as the party of principle — -as avatars of fiscal as well as personal responsibility, small but sound government, law and order, and, in the international community, reliable leadership of the free world. But, no more. In the GOP’s deepening alliance with our faker of a president Donald Trump, principle clearly is no longer operative — -and the need to hold on to power is. Eighteen months in, proofs of Republican betrayal abound. Most egregiously: After decades of haranguing Democrats for their spend-y ways, Trump explodes the debt and deficit with his $2 trillion tax cut to corporations and the rich, and Republicans are fine with it. Likewise, the former national security scourges are hanging back from forcing Trump to deal with documented Russian interference in our elections. In their comprehensive betrayal of both political principle and Christian morality, then, the GOP can now be said to be the party of the unprincipled and amoral Donald Trump. (For how, see “Frontline” documentary, “Trump’s Takeover,” here.) This also can be said: In sacrificing principle and morality for power, Republicans have made a Faustian bargain with the Devil, a notion voiced by various commentators, both conservative (here, here, and here) and liberal (here and here). As a concept, “Faustian bargain” is pretty universally understood: It means selling your soul — -the best of who you are, that which you cannot do without and still be — -for whatever worldly objective it is that you desire: money, power, career. People “get” that if you pay with your soul, you have paid far too much. Curious about the source, and hoping poetry would appeal to Republicans to reform altogether, I went to Johann Wolfgang von Goethe’s epic poem, “Faust” (all 486 pages of it), and Christopher Marlowe’s play, “Dr. 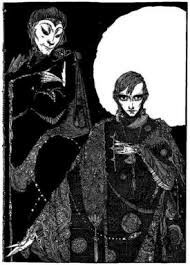 Faustus.” Like many, I knew what Faustian bargain meant, but had not read the original. I confess I was disappointed (and thus took a pass on Thomas Mann’s novel, “Dr. Faustus”). First, surprisingly, Faust puts up no moral struggle at all — -none — -in ceding his soul to the Devil in his quest to “have all secrets at my fingertips.” Goethe’s Faust even says, “With me, best leave morality alone!” In Marlowe, when the Devil asks, “And tell me, Faustus, shall I have thy soul?” Faustus a few lines later responds, “Ay, I give it thee.” As bargaining goes, and certainly as moral struggle goes, it’s all way too easy. Which, come to the point, describes the remarkable ease with which Congressional Republicans, except for a few rebels like Sen. Jeff Flake, have sealed the (moral) deal with Trump. “Say he surrenders up to him his soul. Yet, while neither Goethe nor Marlowe present Faust as a moral character or the bargain he struck with the Devil as a moral struggle, leaving us instead with lots of bad behavior, both works are instructive on human nature and the way of the world generally. And when things fall apart and war ensues, when all morality and ethics are gone, they are especially adept at describing a world that is, in a word, Hell on earth. Rather like our world today. But as the world in the Faust legend goes to ruin, with the poets vividly describing the attendant destruction and suffering, they only indirectly throw light on the policy and character that could yield peace or a better day. The poets are far bigger on damnation than on ruin-avoidance. So, Republicans: Listen up to the damning annotation. “That’s it! They no longer feel constrained…. They quickly renew eternal strife. Far and wide the noise is rife. In the end, by all the Devils, yes! Each could, and would improve his station. Even the smallest wished to be great enough. Not honor, affection, gratitude, dedication. Clearly, the solution is: Avoid the slide into Chaos in the first place or, once into it, reverse however you can. In Trump’s America, the power to reverse the slide lies with the Republicans, who control both houses of Congress and nominally could check the proto-tyrant. Of course, in the coming midterms Democrats absolutely must retake power, galvanizing to recapture the House, if not the Senate, too. Yet — -this just in — -Politico reports new “thinking” among Congressional Republicans, to wit: that even if Democrats retake the House in November, and even if they seek Trump’s impeachment, why, that would “both rally [Trump’s] base and make the president sympathetic to moderates.” This “lose-to-win” gambit, which requires the Senate remain GOP-controlled, has “surfaced spontaneously among a diverse set of conservatives” and “dovetails with the growing conviction….that the president could use congressional gridlock under a Democratic House majority as a….battering ram, offering it up as the picture of Washington intransigence as he vies for reelection.” And if a demonized Nancy Pelosi is reelected by Democrats as Speaker, so this “thinking” goes: Game over! One can almost hear Mephistopheles snort with laughter and paw the ground. To recur to Faust and to Mephistopheles’ taunt that “No one dare to criticize the situation,” this appeal to today’s Republicans, who once upon a time were principled: Will no one dare criticize — -this nefarious “plan,” this proto-tyrant Donald Trump? Strength being found in numbers, will no one among Republicans dare organize an anti-Trump insurgency? Or will this all be “a step too much”? The dire fate haunting the Faust legend need not necessarily apply to America, because, even as unhappy and disoriented as we are now, we are not fatalists, we still believe we can make our own fate. So, Republicans: Throw off the Faustian bargain — -for your own soul as well as the nation’s. Finally, Republicans: If an appeal to the soul means little to you, and to the far-gone corrupt it would mean nothing, then bear in mind another verdict. As the English philosopher Francis Bacon said, “The inescapable property of Time is ever more and more to reveal the Truth.” The power-hungry may not care about moral questions, but they do care, desperately, about winding up on the right side of History. Think, then, about History’s final estimation of collaborators and co-conspirators throughout the annals of Time.